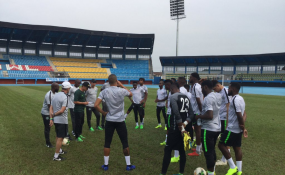 The camp of the Super Eagles in Asaba, Delta State, is already bubbling as players invited for Friday's 2019 Africa Cup of Nations qualifying match against the Pirates of Seychelles and friendly match against Egypt have started breezing in. China-based Odion Ighalo and midfielders Alex Iwobi and Semi Ajayi were among the first arrivals in the Super Eagles' camp in Asaba according to a statement from the Nigeria Football Federation spokesperson, Ademola Olajire. Already, the Super Eagles have qualified for the Africa Cup of Nations holding in Egypt this summer, and the encounter against the Pirates is hardly more than an academic affair. But the Eagles have spoken of a need to end the qualification series on a high and maintain reputation while using the game to kick -start preparations for the AFCON.